The 5th Annual Chocolate for Congo will be taking place for the entire month of February in participating restaurants and bakeries throughout Portland. It couldn't be easier to do a little good while indulging in some of the tastiest desserts in town. All month long, 13 Portland restaurants and bakeries will be serving up chocolate desserts made with Theo Chocolate. 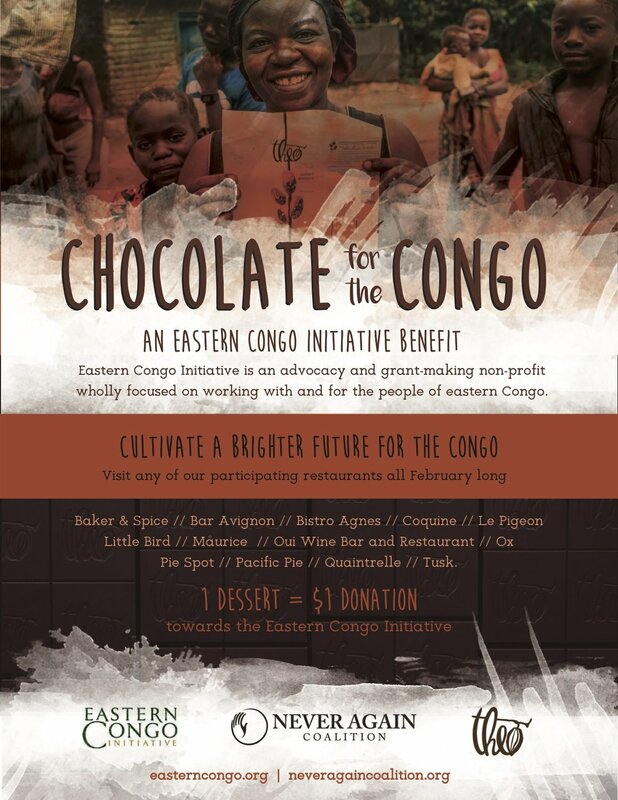 One dollar from the sale of each dessert will go to Eastern Congo Initiative (ECI), a non-profit working on grant-making and advocacy with and for the people of eastern Congo. Theo Chocolate, which now sources more than 70% of its chocolate from the Congo, has generously donated the chocolate for the benefit. Participating restaurants and bakeries are Baker & Spice, Bar Avignon,Bistro Agnes, Coquine, Le Pigeon, Little Bird Bistro, Måurice, Oui! Wine Bar + Restaurant, Ox Restaurant, Pacific Pie Company, Pie Spot, Tusk, and Quaintrelle. Here are a few highlights - Nora Antene will be making Chocolate and Tehina Marbled Cheesecake at Tusk. Soon to be open Bistro Agnes will be offering a classic Tarte au Chocolate. Over at it's sister restaurant Ox, you can Turtle Sundae with Theo Chocolate Ice Cream, Salted Caramel Sauce, Chantilly Cream, Roasted Pecans, and Amarena Cherry. Little Bird's pastry chef Erin Hughes has created a Chocolate Rootbeer Cake with toasted marshmallow ice cream, malt crumb, burnt meringue. The eastern Democratic Republic of Congo has been plagued with violence for far too long. The path to peace is long but through their partnership, With the support of export partner Esco Kivu, Theo Chocolate and Eastern Congo Initiative are making a real difference in the lives of Congolese people. Theo's cocoa sourcing from Congo now supports over 4500 farmers and in turn, over 32,800 family members. Theo also supports a new maternal health initiative that has thus far eliminated maternal and newborn deaths in in these farming communities. Remember, there are 28 days in February and 13 restaurants and bakeries participating in Chocolate for Congo. Can you eat all 13 delicious desserts before the month ends?